The image for the challenge came across a bit creepy and Halloweenish so I decided to go with something that I think is a bit brighter and fresher. If you don’t see your Haiku below, I went in search of the regular members but didn’t see any Haiku for some this week, but I did find a few that didn’t show on the Challenge Post in any form. Remember if you don’t us the ping back link, make sure to leave a link to your Haiku in comments on the original Challenge post for the week that is published on Monday. 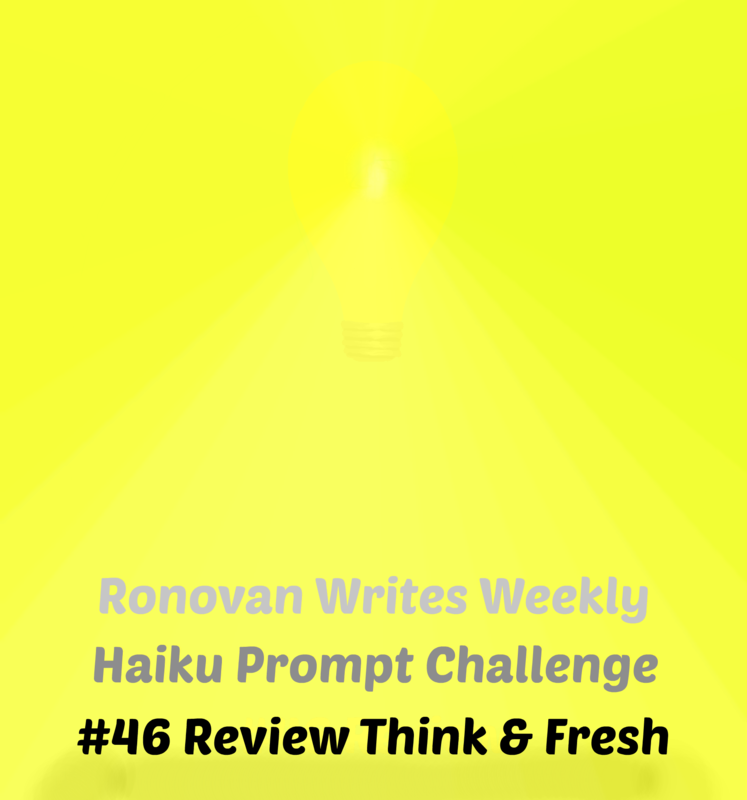 Week #46 Haiku Challenge Review of the Words Think & Fresh. Melissa Barker-Simpson of Melissa Barker-Simpson (Author): “I am a mother, and a writer; an interpreter, and a geek. I am an introvert, and a drama queen; kind, and stubborn; intelligent and down to earth. I enjoy to connect with the blogging community and chat about a myriad of subjects. I keep my author site separate, but if you would like to visit and learn more about my published works, please click here.“ The Haiku: Okay there were several Haiku. Trying to come up with a name for them is a bit difficult. Hmm. Revealed Thoughts. As Melissa mentions in her about blurb she is an author and make sure to visit her Author Page on Amazon here. Janni Styles of JanniStyles1: “When I announced to my first grade teacher, “I know what I want to do when I grow up – I want to make books!” – I had no idea what lay ahead. “~From her Glimpse Page. The Haiku: Think Fresh. Hmm, I am trying to image that image. That would be interesting to see. Angie Lin of Muddied Thoughts: Signals. Have to like this one. This one made me kind of pause and think, when and how did she come up with it. Not a complicated Haiku, but I like the message of it in the simplicity and calmness of it. Very nice. Sue Vincent from Daily Echo: Fresh. Okay, now this one seriously has a message. And I think depending on your stage in life both age and relationship experience, this one could speak volumes. Excellent Advice Haiku. MUST READ. Sue is one of our resident authors with a LOT of books on Amazon. Click here to check them out. @SCVincent But Check out her NEW BOOK by clicking the image. Available in Paperback and for Kindle. Becky G of Becky G? Oh, That’s Me! : Fresh Start. Fresh start of what. You know as I wrote the title I knew what I was thinking and of course me being me I thought other things, which I left in the comments of the Haiku. Sandra of Wild Daffodil: Wisdom. Most excellent here. Combined a photo and the Haiku challenges. I love it when people do that. This one worked out well. Steven Walsky of Simplicity Lane: Bread. Okay, just looking at the title I like this one already, now to see what it’s about. And it did not fail. 🙂 But was I thinking food or money? Hmm. What do you think Steve wrote about? Simplicity Lane is free, go here for where you can get it. Through a Stranger’s Eyes here and Résumé for Love for free here. Claudette of to search and to find happiness in every day: Regrets. Hmm, another nature reflecting emotional ones in my eyes I think. Okay, so the title Regrets sort of puts that out there too but the words of the Haiku in a seasonal way lead you in that direction. Skybright1 of from heart to head: Season Sighs. You know, I am torn between that fresh part cause of my hot nature and the later part. I mean, I wish it were like in the low 70s year round with a slight breeze I think. Imagine being allergic to the heat and the sun. It’s a lot of fun. Ruth of Mad Meandering Me: Afternoon Nap Adorable. That’s pretty much all you can say. That, or nightmare, depending on your own state at the time. Dr. KO of KO Rural Mad As Hell Blog: Think fresh. I’m almost scared to look. This lady has a way with words that has me sitting and staring for a while trying to follow the trail to how she got to where she ended up. Now to go see what she did this time. If you do a search of the name mentioned in the post you will find some wonderful works. I did, of course. Someone gets creativity through DNA it seems. Mari T. of Overcoming Static: Suddenly. You know, I actually bought a book about this very topic way back when. Best money I may have ever spent, or so I have been told. Canaf of Faithful Devotionals: Think Before You Act. Ha, love it. Colleen of Silver Threading: A New Day. I think she is conflicted here. One she has an addiction wants to sate and another she, well I think she has two of them she needs to take care of. @ColleenChesebro Also remember to drop by the LWI site and read Colleen’s Book Reviews and Interviews with Indie Authors. She is excellent. Click here to see everything she’s written. My one own Haiku this week was Night Thoughts. I started the review on Monday as they came in. Hoping I could stay ahead of them. Thanks Ronovan – great review. Have a few more blogs to visit now! Thanks Donovan, I love reading your reviews and visiting the Haiku. And your closing Haiku is so true, I love the lift it gave me! Thank you. It seems my better Haiku come when I just write the first thing that comes to mind. I was about to post when I realized I hadn’t written a closing Haiku. And there it was. Agreed! And I apologize for not adding my enthusiasm for that closing Haiku, Ron. I was cheering as I read it for I believe with all my heart that in order to achieve, we must be taught to conceive first. Your point is relevant to all aspects our of lives Many people believe that we create by default and I am not so sure that makes sense to me for whether or not we are aware consciously, we are always in that creation process. Therefore I embrace the view point that we create either consciously or unconsciously. Your haiku, reminded me of this and hence, the cheering began! 🙂 GO YOU! Your haiku is a challenge and a truism. Taking your closing haiku to heart 🙂 Now I’ll have to schedule time to visit everyone, thank you for doing the review each week. Oh, name of my haiku? Nice. Lol. You wrote something nice about my mom! You are wonderful! Thank you! Hi Ron! Thank you for the awesome review and for all you do each week. I’m sorry for the late response. I don’t know if you’ve figured it out but I haven’t been able to get online for almost two weeks (torture). My laptop finally gave out and it’s been a nightmare but I’ve resolved the issue. Thank you for the cool name for my haiku! I noticed there hadn’t been any posts. So I assumed you weren’t ignoring us. 🙂 Happy you are okay, that’s the main point. Blogging doesn’t matter over that. Doesn’t even come close.